Mercedes Russell also had another strong performance for Tennessee (10-5, 2-1 SEC), recording her 10th double-double of the season with 17 points and 14 rebounds. The Big Orange were just the second team this season to outrebound the undefeated Bulldogs, finishing with an 48-39 advantage on the boards. 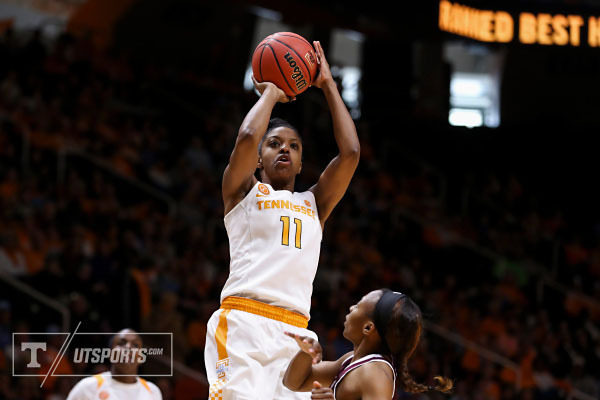 The Lady Vols were aggressive on both ends of the floor and did the majority of their offensive damage from the charity stripe, going 30-for-35 from the free-throw line on the afternoon. UT also held MSU to just 37 percent shooting from the floor, well below their season average of 48 percent. The Bulldogs also had three players score in double figures, led by Morgan William who finished with 21 points and four assists. Victoria Vivians finished with 20 points while Teaira McCowan finished with 14 points and nine boards. After trailing for the majority of the first half, Mississippi State finished the second quarter on a 13-2 run to take a 41-34 lead at the break. The Bulldogs made UT pay for turning the ball over, scoring 10 points off nine Lady Vol turnovers in the first half. MSU also finished the half with an 11-2 advantage in fast break points. The dynamic duo of Russell and DeShields paced Tennessee as both finished with 12 points in the first half. The Lady Vols were almost perfect from the free-throw line, converting 14-of-15 attempts to stay within striking distance heading into the locker room. Tennessee battled back throughout the second half and cut the deficit to one after DeShields made an incredible block that led to a layup by Jordan Reynolds on the other end with 6:42 to play. UT took its first lead of the second half on a DeShields layup with 3:04 left to play, however, MSU outscored the Lady Vols 13-2 the rest of the way to seal the victory. “Obviously disappointed in the outcome but I’m really proud of our kids. I thought we played hard, great effort, great energy. We just couldn’t finish the deal. So we go back to practice and continue to get better,” stated Tennessee Head Coach Holly Warlick. Redshirt junior center Mercedes Russell recorded her 10th double-double of the season on Sunday with 17 points and 14 rebounds. It was the 21st of her career, which ranks 13th all-time at Tennessee. Despite the loss, the Lady Vols made Mississippi State work hard for its points all game long. The Bulldogs were outrebounded for just the second time this season and were held well below their season field goal percentage of 48 percent, shooting just 37 percent on the afternoon. Tennessee continues SEC play with a trip to Oxford, Miss., to take on the Ole Miss Rebels on Thursday at 7 p.m. ET. The game will be streamed live on SEC Network +/WatchESPN.